Dr. Sarker is engaged in theoretical research into the problem of highly correlated electron systems, such as the high-temperature cuprate superconductors, fullerenes, heavy fermion systems, and rare-earth-transition metal-oxides. His work seeks a theoretical understanding of unusual properties of these systems, caused by a delicate interplay between the charge and the spin degrees of freedom, based on the Hubbard and the related t-J and Anderson models. Professor Sarker is particularly interested in the breakdown of Fermi liquid theory, and the occurrence of commensurate and incommensurate magnetic order and associated metal insulator transitions in many strongly correlated materials. 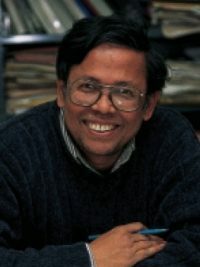 Professor Sarker received his doctoral degree from Cornell University in 1980. He joined the faculty of The University of Alabama in 1984.